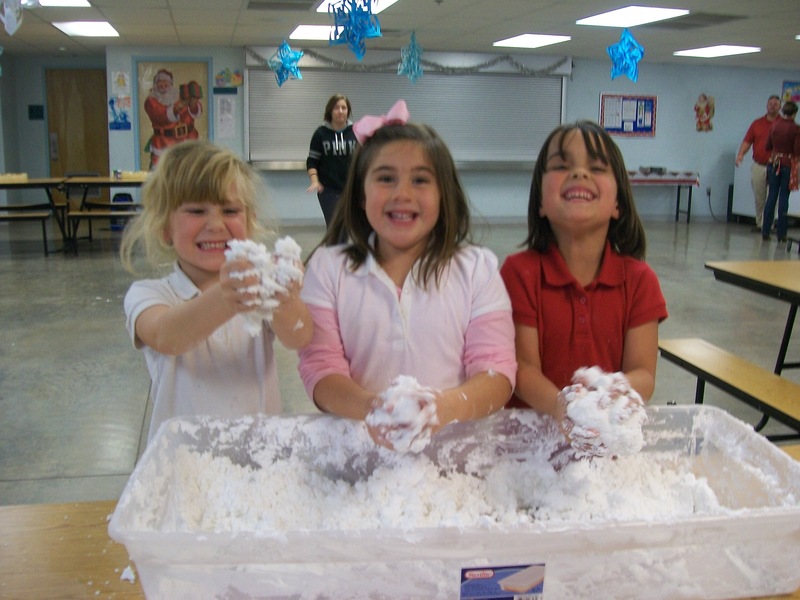 “Magic” indoor snow provides messy fun at the Polar Party. The Center for Academic Success celebrated the Christmas season with plenty of fun surrounding the holiday in addition to high-quality learning activities. Students in the k-4 elementary held a Polar Party blowout in which students decorated sugar cookies, played pin the ornament on the tree (similar to pin the tail on the donkey), and molded indoor snowmen from “magic” Arizona snow [see photo left]. 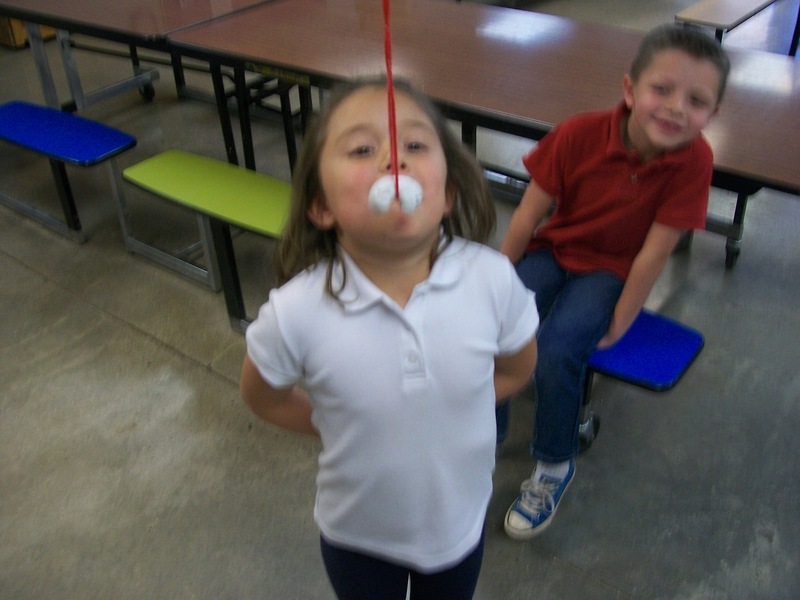 Kinder students enjoy Donut Dangle game. Students also raced to eat sugared donuts off a string and worked with art teacher Ms. Marshall to create reindeer clothespin ornaments. At the culmination, students selected three different reindeer snack mixes to take along to view the classic cartoon — The Grinch. 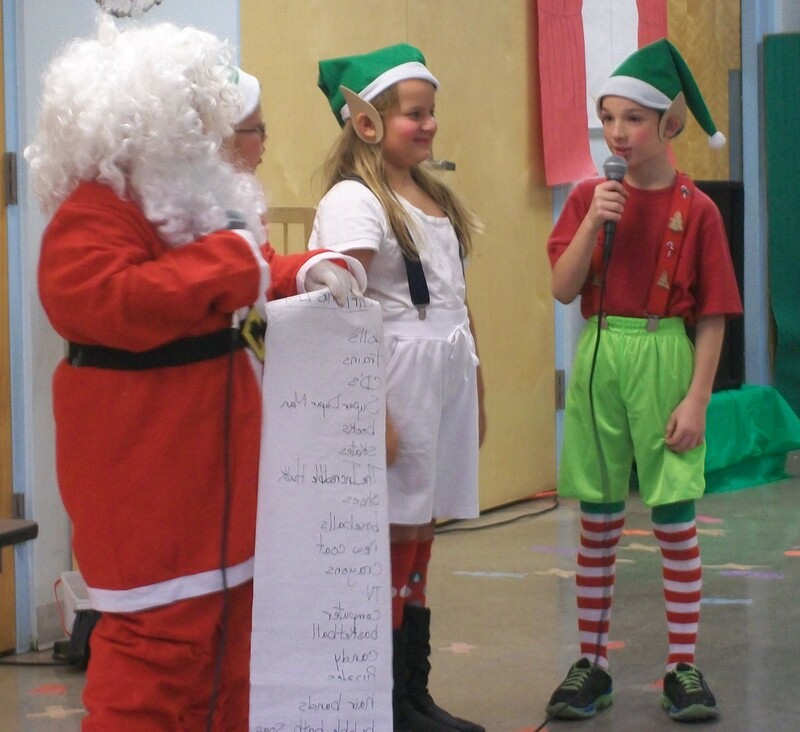 Santa and elves review the “nice” list in 4th grade musical. Fourth Grade cast poses before their performance. Many thanks to both the fourth grade class and Music Teacher Ms. Dokken who made this ambitious musical possible. CAS also involved family and world-heritage traditions in its holiday celebrations with many classrooms decorating gingerbread houses, researching Christmas around the world, and explaining family food and gift traditions. Classes learned the stories of Father Christmas, Saint Nicolas, and the story of The Magi which have transformed over the years into holiday gift-giving. Although not every CAS family celebrates Christmas, those with differing traditions were able to explain holidays like Winter Solstice, Hanukkah, and Kwanza to their classmates. Several students who do not observe holidays also shared their family traditions and beliefs for this time of year. Whatever your family traditions, CAS offers you and yours a very Merry Christmas and time of joy this holiday season as we reflect on the year. CAS will observe a half-day with a 12:00 release on Friday, December 19th and will be closed for the holidays for two weeks. Classes will resume on Monday, January 5th, 2015.